Irving Berlin had a #1 hit last October when the new album GOD BLESS AMERICA (Sony) debuted at the top of the Billboard charts; Celine Dion's blazing new rendition of the title track was first heard the previous month on A TRIBUTE TO HEROES, the internationally televised, all-network telethon...Other recent, notable recordings of what the New York Times calls our ""#1 anthem"" include covers by Barbra Streisand (previously unreleased bonus track through the Target Stores promotion of her Columbia album, CHRISTMAS MEMORIES); LeAnn Rimes (a CD single from her Curb Records album, INSPIRATIONAL SONGS); Marilyn Horne (BERLIN LIEDER, Shell Castle); NYPD officer Daniel Rodriguez, with the verse recited by NYC Mayor Rudolph W. Giuliani (Manhattan Records); and Mr. B. himself - a 1939 NBC Radio broadcast, captured on IRVING SINGS BERLIN (Koch International). The first months of the Rodgers Centennial will see the release of several new recordings, compilations and long-awaited reissues: Do I Hear a Waltz? (Fynsworth Alley) features the 2001 Pasadena Playhouse cast, including Alyson Reed, Anthony Crivello and Carol Lawrence... BERNADETTE PETERS LOVES RODGERS & HAMMERSTEIN (Angel; mid-spring) features the two-time Tony-winner in her first album of R&H, including ""If I Loved You,"" ""It Might as Well Be Spring"" and the charming rarity, ""I Haven't Got a Worry in the World""...A RICHARD RODGERS CELEBRATION (RCA Victor; April) features Keith Lockhart and the Boston Pops, joined by guest vocal artists Martina McBride, Larry Gatlin and Colin Raye...THE RICHARD RODGERS CENTENNIAL JAZZ ALBUM, produced by Fred Hersch, and sponsored by Williamson Music to benefit Broadway Cares/Equity Fights AIDS (www.bc/efa.org), features the talents of six of the world's preeminent jazz pianists, including Kenny Barron, Bill Charlap, Benny Green, Marian McPartland, George Shearing and Hersch himself...Highlander Records, a non-profit record label established by the students and faculty of Radford University's Music Business program, has just released LITTLE GIRL BLUE: SONGS BY RODGERS & HART. 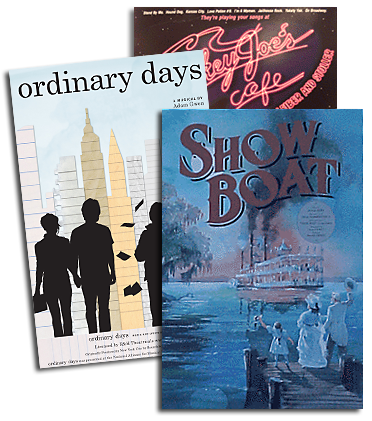 Among current reissues and compilations, Angel Records has just released the motion picture soundtracks to Oklahoma!, Carousel and The King and I - extensively remastered and repackaged last year - in a new, boxed set...Angel is also reissuing No Strings (March), featuring Rodgers' 1962 Tony-winning score, the only Broadway score for which he wrote both music and lyrics...Decca Broadway has reissued RODGERS & HAMMERSTEIN OVERTURES featuring John Mauceri and the Hollywood Bowl Orchestra...Readers Digest Records is issuing a Centennial edition of the Maureen McGovern album, WITH A SONG IN MY HEART...Universal Records will issue a special Centennial edition of the classic SUPREMES SING RODGERS & HART with extra bonus tracks (April)...DRG's new compilation album, RICHARD RODGERS: THE SOUND OF HIS MUSIC, features an eclectic range, from ""The Surrey with the Fringe on Top"" performed by the Hi-Lo's, to Elaine Stritch's ""You Took Advantage of Me,"" Shirley Bassey's ""The Lady is a Tramp,"" Eartha Kitt's ""Why Can't I?,"" Barbara Cook's ""This Nearly Was Mine"" and Josephine Baker's ""C'est Un Nid Charmant"" (a.k.a. ""There's a Small Hotel""). SONGS I HEARD (Sony) is Harry Connick Jr.'s new album of songs from childhood, including ""Do-Re-Mi,"" ""The Lonely Goatherd"" and ""Edelweiss""... Charlotte Church performs ""Bali Ha'i,"" ""If I Loved You"" and ""Can't Help Lovin' That Man"" on ENCHANTMENT (Sony)...On SONGS FOR MY FATHER (Harbinger), Heather MacRae sings standards from the film musicals starring her dad, Gordon MacRae, including Oklahoma! and THE DESERT SONG...Recorded live in front of 50,000 theatre fans in Times Square in early September, BROADWAY ON BROADWAY 2001: LIVE FROM TIMES SQUARE (Sh-K-Boom Records, to benefit BC/EFA) begins with a spirited rendition of the Oklahoma! overture conducted by David Chase. Celebrating Irving Berlin's early years: WATCH YOUR STEP (Original Cast Records) features the 2001 Musicals Tonight cast of Berlin's 1914 musical...SHE'S SO BEAUTIFUL (Oakton Records) features the duo of Benjamin Sears and Bradford Conner performing songs written for the famed impresario Florenz Ziegfeld, and includes 11 first-time recordings. Australian soprano Clare Gormeley features the songs of Ricky Ian Gordon on her new album WHERE MORNING LIES: SPIRITUAL SONGS (ABC Classics), including ""Angel Wings,"" ""White Haired Woman,"" ""God's World"" and ""Will There Really Be a Morning? ""...Betty Buckley's new CD, THE STARS AND THE MOON (Concord) has five Gordon songs, including ""Finding Home,"" ""The Red Dress,"" ""Souvenir,"" and ""A Horse With Wings"" (paired with Adam Guettel's ""Migratory V"")...D.C. Anderson features the premiere recording of a Mary Rodgers-Stephen Sondheim song, ""Christmas Island at Christmas Time"" on his new holiday album, ALL IS CALM, ALL IS BRIGHT (LML Music), so make a note now for next year's wish list.